Learn about our neighborhood at Springs at Tapestry. 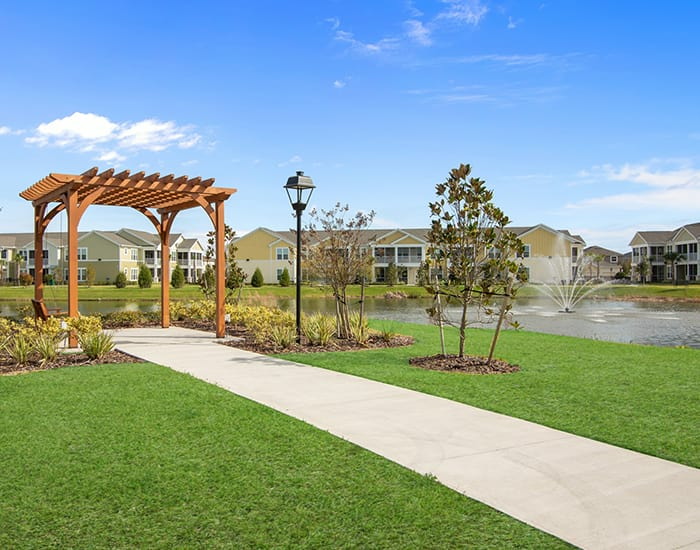 Click to learn more about the Springs at Tapestry pledge. 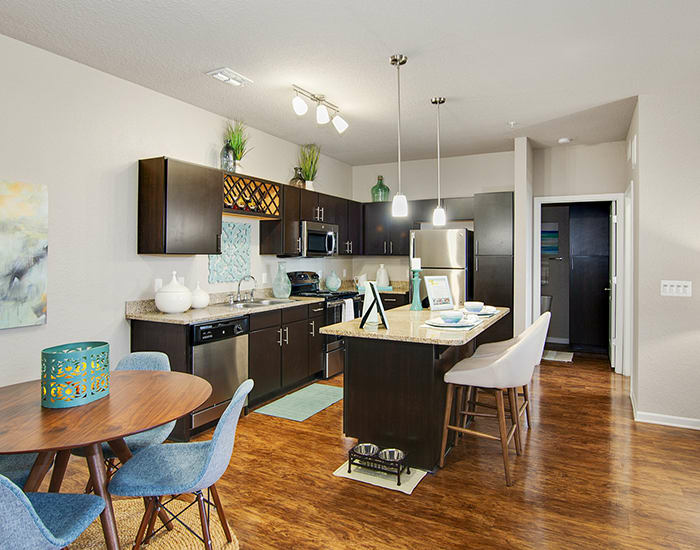 Set under the clear blue skies in the sunshine state of Florida, Springs at Tapestry is your destination for laidback living in Central Florida. 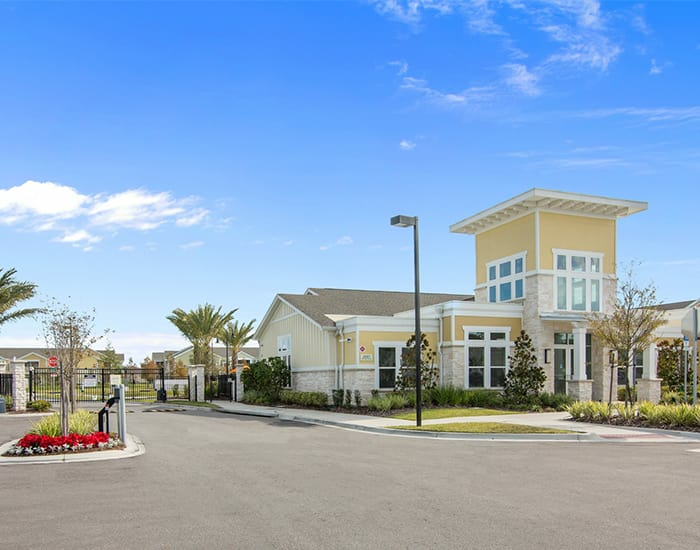 Our luxury community is located in beautiful Kissimmee, Florida, a charming suburb of Orlando. Inspired by the world-class resorts in our neighborhood, Springs at Tapestry boasts luxury amenities at every turn. With lofted 9’ ceilings and durable hardwood-style floors, our studio, 1, 2 & 3 floor plans sparkle with natural light. Plus, the available attached and detached garage options mean your parking spot is always there for you when you return home to our gated community. On the weekends, relax by our gorgeous outdoor swimming pool, or work up a sweat at our state-of-the-art fitness center at the clubhouse. Our front office team will be there to greet you with a smile. Treat yourself to luxury living at Springs at Tapestry. At Springs at Tapestry, great customer service means wonderful and personal greetings, well-maintained grounds you can be proud of, quick and quality maintenance resolutions, and timely follow-up from our team. You can always count on us to listen and be accountable. We love your pets at Springs at Tapestry! 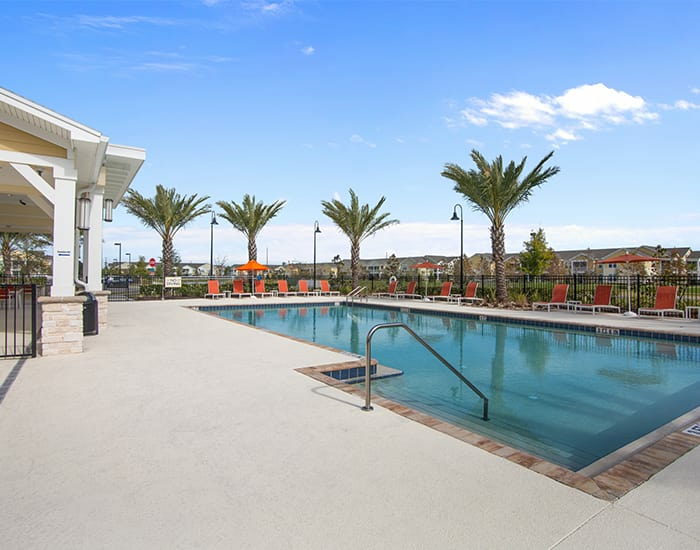 Ideally located in sunny Kissimmee, Florida, Springs at Tapestry offers easy access to some of the world’s most popular destinations. We’re situated just twenty miles south of downtown Orlando, and only eight miles from Walt Disney World Resort. In addition to our proximity to family-friendly attractions and vacation hot spots, our neighborhood boasts daily conveniences, beautiful scenery, and great restaurants. Stop for groceries at nearby Fresh Market, Publix, or pick up specialty items at The LOOP. If you like to fish, Lake Tohopekaliga, one of the area’s premier bass fishing lakes, is less than twenty miles away. If you don’t catch anything, treat yourself to a meal at 4 Rivers Smokehouse instead. We are pet-lovers at Springs at Tapestry. That’s why we have designed our community to accommodate pets and their favorite humans. We allow cats, dogs, birds, reptiles, fresh and saltwater fish, small furry animals, and most exotic pets to our luxury townhome-style apartments. Let your indoor pet escape the Florida heat in your studio, 1, 2 or 3 bedroom apartment with refreshing central air conditioning. Plus, you and your dog can play a nightly game of fetch at our on-site dog park. Be sure to rinse off your furry friend's muddy paws at the pet spa station so she doesn’t leave footprints on your beautiful hardwood-style floors! Embrace resort-inspired living at Springs at Tapestry. Contact our friendly experts to schedule your tour of our luxury apartments in Kissimmee, Florida.